Photo by Salvage Vanguard Theater. As they say at SVT, prepare for impact. 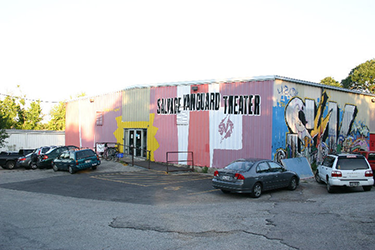 This nationally renowned Austin artist hub produces new plays, musicals and operas by some of America&apos;s most daring playwrights and composers. Theatre + Art Gallery + Filmedia Studio, the Blue gathers artists together to bring you new and timeless classics in the form of award-winning theatre performances, gallery space and educational opportunities. Improv theater, a.k.a. live performances made up on the spot, is a hilarious time. The Hideout hosts shows Thursday through Sunday that range from comedy, plays and sketches to family-friendly and competition-based acts. Catch some of the funniest comedians in Central Texas performing improv, stand-up, sketch, film and much more. ColdTowne hosts live alternative comedy seven nights a week. Erected in 1871, the same year Austin became the capitol, the Scottish Rite Community and Children&apos;s Theater is a former German opera house turned nonprofit theater. Shows for all ages shine here, including live world music and multimedia children&apos;s programming. Large-scale productions are held in local warehouses, abandoned structures, power plants and other obscure locales. Get ready to be amazed as performances "explore movement through the air: extending boundaries, defying edges, and suspending graceful athleticism for the risk of igniting ephemeral beauty." Wow. This Austin gem is shaping writers, designers, directors and actors, serving up works by new and established alternative theatre greats. Grab some friends, a big blanket and a picnic basket and head to Austin&apos;s beloved and beautiful Zilker Park for Shakespeare, family films, jazz and musicals. Let Austin&apos;s acclaimed professional ballet company and its glorious dancers grace you with classics like "Swan Lake" or stunning contemporary works such as "One/the body&apos;s grace." Drop in for a dance class and get instruction from the professionals. The Austin Symphony Orchestra, Austin Lyric Opera and Ballet Austin perform at this state-of-the-art venue. You&apos;ll also find tap dancing, children&apos;s theatre, outdoor concerts and touring acts like Blue Man Group, along with a slew of homegrown Austin talent. Celebrating 81 years, the ZACH is Austin&apos;s premier intimate theatre-going experience. Dramatic, musical and comedic productions are produced in-house and are built to elevate and inspire.